Christianity came to India early, several centuries before it reached Europe. Today's Syrian Christians in Kerala claim to have been converted by St. Thomas and thus to follow the earliest traditions of the Apostolic Church in India. The saint is believed to have landed at Kodungallur in 52 AD and converted a few Namboodiri or Brahmin families there. As St. Thomas came from Syria, they are known as Syrian Christians. Today they are the aristocrats of Kerala. Their faith was consolidated in the 4th century when Christians from Baghdad, Jerusalem and Nineveh arrived with the merchant, Thomas of Cana. Down the centuries the Syrian Christians of Kerala have thrived in commerce, culture and politics. St. Thomas then went on to Mylapore near Madras where he converted some locals before Hindus martyred him in 68AD. 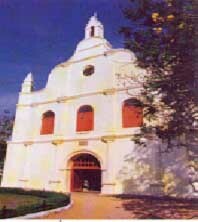 Later, the Portuguese commander Alberque brought missionaries to Cochin in 1510 after Vascodagama's visit in 1498 to build the first Christian church. The Syrian Christians said their prayers in Cyriac, not Latin, and Kerala's later converts came to be called as Latin Christians. In the 19th century the Syrian Christians split over language; some retained the language Cyriac and the others changed to Malayalam and are called as Marthoma Syrian Christians. Meanwhile up the coast, Goa was established as the capital of the Portuguese maritime empire in 1510. With the Pope's blessings to convert en masse, the city became busy with missionaries and the Jesuit St. Francis Xavier made it his headquarters in 1542. 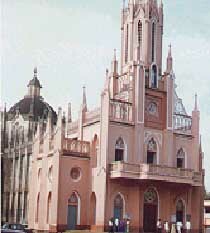 During the present century the Anglical church formed the Church of South India together with some free churches in 1947. It was the Christian missionaries who brought printing to India. In 1556 some Jesuits taking a press to Abyssinia for Christian propaganda work, broke their journey at Goa and failed to continue. St.Francis Xavier used this to print Doctrina Christa, a catechism used to teach children at Jesuit schools and colleges. In the 19th century William Carey and his followers, Joshua Marshman and William Ward, came to Serampore in Bengal and stared the first printing press and newspaper in Bengali. Kerala and Tamilnadu in the South and Arunachal Pradesh in the North, account for 60% of India's Christian population. A quarter of all Kerala are Christians, following a variety of denominations, the main five being, Nestorians, Roman Catholics, Syrian Orthodox, Marthoma Syrians and the Anglical Church of South India. Kerala churches are painted in bright colors, their architecture a mishmash of Portuguese, Dutch and the British. Goa and Maharastra also have a huge number of Roman Catholics. Mizoram and Nagaland in the northeast contain all sects of Protestants. The Christians in India are organized into local communities, regional bodies like diocese, union councils and national ones like synod national federation. Most of the churches have a bishop for each diocese. In the churches shoes are often left outside and women and men sit on opposite sides of the nave. A Catholic church has fine statues and paintings all over with pictorial representations on the ceiling and aisles. But in the Protestant churches use of such cult images are totally forbidden. In Christian worship, the main thing is the observance of the Lord's Supper also called as Communion. This is a rite, which is followed on every Sundays in most of the churches. Communion is taken in remembrance of the death of Jesus , the bread representing His body which was broken and the wine representing His blood which was spilled on the cross. The Jews arrived on India's west coast as traders, supplying Rome, Constantinople and the rest of Europe with valuable spices. They first came to Kerala as refugees from Jerusalem when it first fell to Nebuchadnezzar in 587 BC. 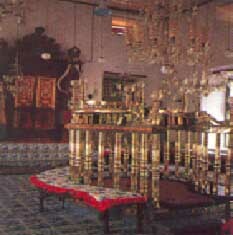 Jews have been a strong community in Kerala for at least a thousand years, first at Kodungallur until their expulsion in 1568 and then at Cochin where there used to be 8 synagogues. The white Jews retained their purity and distinctive community, while other Jews intermarried with the locals and came to be called Black Jews. Further up the coast the heyday of Indian Jewery was under the British. The largest community lived in Bombay. There was also quite a large number in Calcutta and trading expanded to manufacturing, administration and the army. The last wave of Jewish immigrants fleeing from Nazi genocide was mainly doctors and professionals.